[Ten years ago, in May 2008, an unassuming group of five Japanese climbers who dubbed themselves the Giri-Giri Boys caught the world's attention for their bold and visionary enchainments in the Alaska Range. 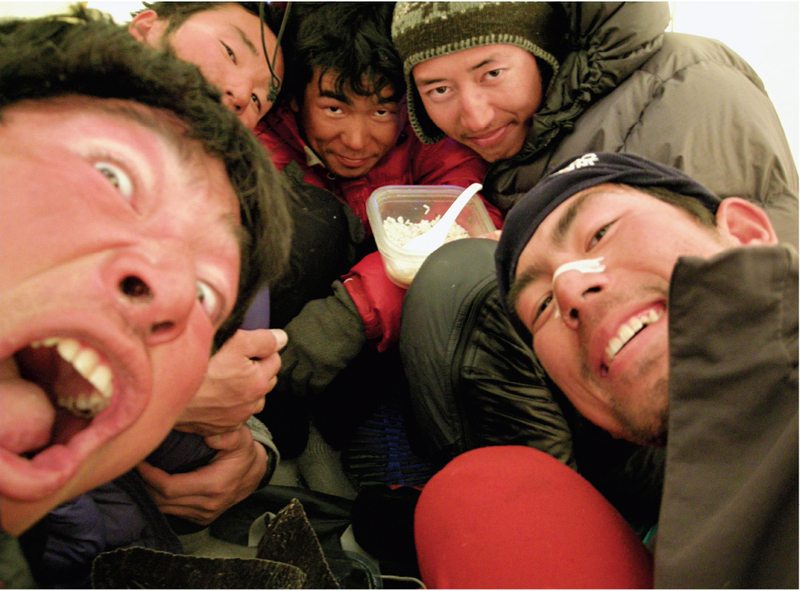 This story by Katsutaka Yokoyama about that expedition originally appeared in Alpinist 26 (Spring 2009), simply titled "The Giri-Giri Boys." Alpinist 63—which is now available on newsstands and in our online store—features another story by Yokoyama about the enchainment of K7 West and Badal Peak in the Karakoram Range of Pakistan, which he completed with Takaaki Nagato in 2017. That story is titled "The Light on the Snow." Looking back now I feel foolish. The south face of Denali dominates the view from the summit of Mt. Foraker, as it does from nearly every summit in the Alaska Range. And despite the public reaction to the twenty-five hours in which Rolando Garibotti and I dispatched Foraker's Infinite Spur, both of us felt the ascent had been too easy. Together we sensed a vague emptiness like that of a 5.12 climber who has just led a classic 5.5 crack. Sure, it was nice, but it did not challenge. The serpentine descent down the Sultana Ridge turned out, surprisingly, to be the aesthetic highlight of our trip. The year before, Scott Backes, Mark Twight and I had completed the third ascent of the Slovak Direct on Denali's south face, bypassing the summit, in sixty hours: four brew stops, no real sleep, hard-and-dangerous mixed climbing interrupted by long gunmetal ice fields—my first world-class route. On the descent of the West Buttress, I had wondered aloud if I had another one in me. Ever. From the summit of Mt. 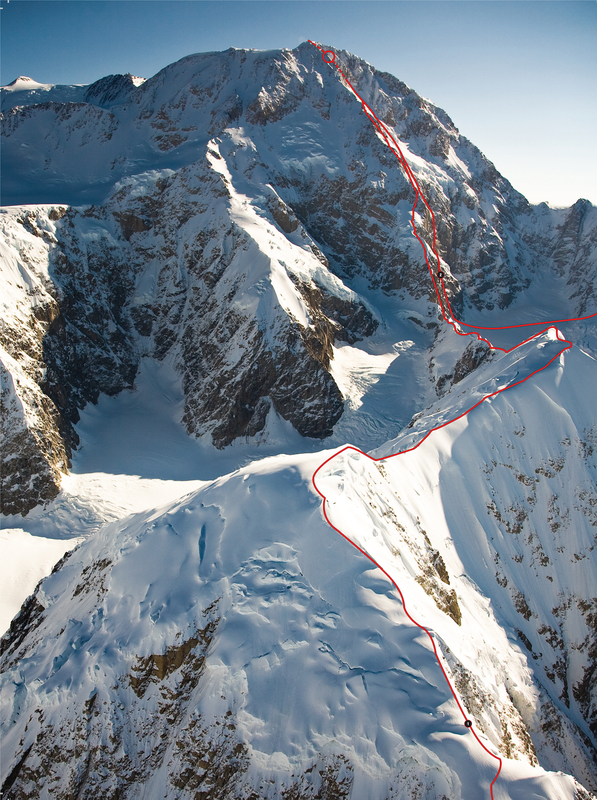 Foraker, it's obvious that there is no bigger, steeper terrain on Denali than the striking line of the Slovak Direct. If Rolo and I wanted more, we had to go elsewhere. Alaska felt climbed out for us. This feeling brings us back to my foolishness. I was in Japan in February 2008 when the Giri-Giri Boys approached me for beta on the Slovak Route. Though they played their cards closely at first, it wasn't long before I knew they were up to something besides a simple repeat of that line. When Jumbo (Katsutaka Yokoyama) told me of their intent to link up the Isis Face to the Slovak Direct, I was forced to slap my forehead and utter a Homer-[Simpson]-esque "Doh!" In a flash I realized that it wasn't the terrain that wasn't big enough. It was my imagination that had been too small. Certain aspects of the enchainment concept, originally popularized in the Alps during the '80s, can come off as contrived. For example, the climax of the European enchainment obsession came on March 11-12, 1987, when Christophe Profit linked the three great north faces of the Grand Jorasses, the Matterhorn and the Eiger. While a great athletic achievement, the need to fly between distant peaks in a chartered helicopter seems to negate the concept of a classic. A classic, to me, implies something that many climbers would—and will—repeat. 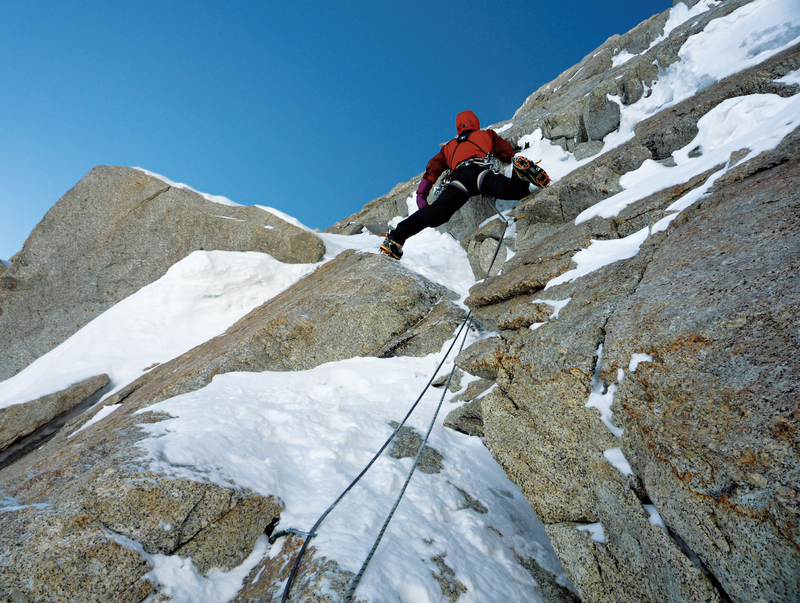 While mechanically dependent enchainments suffer from contrivance, climbs such as the skyline traverse of the Torre group ("The Torre Traverse," Alpinist 25) and the Isis-Slovak linkup ("The Giri-Giri Boys," in [Alpinist 26]) seem destined to become classics for future generations. Clearly, these are enchainments to be dreamed of, trained for, traveled around the world for. The Slovak direct will always have a special place in my heart. I find it remarkable that each of its four ascents serves as an exclamation point to the best idea of the time. The first ascent was done capsule-style with support. The second was done in alpine-style over seven stormy days. The third ascent took sixty hours. The fourth was part of a grand linkup. What's next? Well, it's time to toss out your thinking caps, everyone. Reason isn't going to get us there. Once we've trained ourselves to new levels of fitness, pushed our onsight climbing skills to previously unimagined limits, reduced our clothing and gear to where it can all be measured in grams, what then? It's imagination that we need: Wide-open, full-throttle, day-dreamin' fantasy. The future begins now; subsequent generations will be the fortunate benefactors of the creative vision of climbers such as Katsutaka Yokoyama, Yusuke Sato and Fumitaka Ichimura. There were five of us Giri-Giri Boys in Alaska last spring: Tatsuro "Tats" Yamada, Yuto Inoue, Fumitaka "Itchy" Ichimura, Yusuke Sato and myself. Now there are three. The weather had been fine since partway up our ascent of Denali's Isis Face. Now rain falls in the town of Talkeetna. We waited for days. Tats and Yuto never returned. CLIMBING RANGER JOHN LOOMIS had taken a photo of Tats and Yuto's route—a straight path on a snow ridge between the Kahiltna Peaks and the base of the Cassin. I was at the Denali ranger station in the room set up for the search when I first saw the picture. It made me shiver. The photo showed the Cassin Ridge dropping south from Denali's summit to Kahiltna Notch. The actual ridge doesn't end there, though. It climbs up and over the East and West Kahiltna Peaks and then comes back down to the Northeast Fork of the Kahiltna Glacier. This is the true south ridge of Denali. No one has ever traversed it successfully. The rangers seemed to have trouble understanding the reason for Tats and Yuto's climb. One of them, Tucker, asked, "Why did they head to the Cassin from the Kahiltna Peaks?" My English isn't good, and all I could muster was, "Because it's beautiful." Yet the lure of the Cassin is not an external or a rational thing: it's the invisible claw that grabs at our hearts. And the line Tats and Yuto added to it has something that makes it even more captivating. 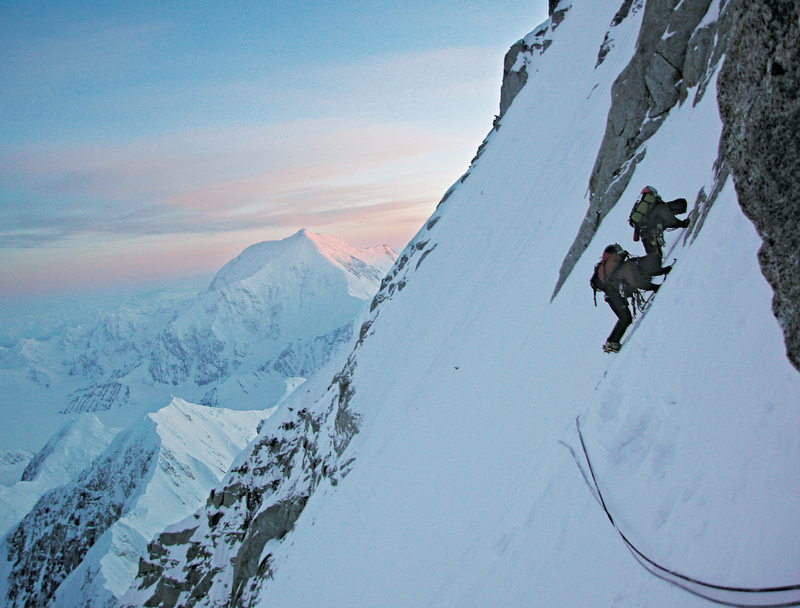 In Alpinist 24, Richard Cassin tried to explain his ascent: "Why did we go by a direct route up the south face? I don't know; we didn't think about it. In fact, I didn't realize it was so direct. We were there and we climbed. And that's all." John understood. "Most American climbers only look at the route above the notch," he said. "But the tracks Tats and Yuto left shatter that vision." Tats and Yuto probably didn't make it to Denali's summit. It's likely they had some kind of accident near the top. Still, I envied them. They were the first to reveal the Cassin's true line of ascent. I stared at the photograph and retraced their route. Though climbers should leave no physical marks on a mountain, we like to believe our passion remains on the lines we draw. We want to follow the lines that only we can make out, that only we can climb. To my regret, I have never encountered a line on which I could express myself fully. But those two made their statement just by leaving their tracks. Although the footsteps in the snow will disappear, the path in the photo retains their passion. It was the essence and the realization of Giri-Giri Style. PEOPLE ASK ME ALL THE TIME: "Hey, what does Giri-Giri mean?" It's not easy to answer. The name doesn't really mean anything. But to understand Giri-Giri, you need some notion of Shi-Shi. And for you to understand Shi-Shi, I must first tell you about climbing in Japan. Try wading through chest-high snow for a day to get to a 200-meter wall. Once you're there, the rock is often fragile and covered with vegetation. Useless bolt ladders and ancient, deadly anchors limit the climbable lines, and it's rare to have a panoramic view because topping out typically involves crawling into a giant thicket. It sounds hopeless, but I really like Japan's walls. I like them because their innate shortcomings force a new perspective. Lately, I've been ignoring existing anchors to figure out my own lines, onsight, no topo necessary. Some people think such climbing is unsophisticated. My friends and I—Tats, Yuto, Itchy and Yusuke, the so-called Giri-Giri Boys—love it. It gives us space for creativity. The quantity of climbing in Japan is still limited. But there is a solution to that, too. It's called Pachinko. Pachinko gets its name from a popular 1970s pinball game in Japan, with its erratic up-and-down movements on irregular trajectories. Simply put, Pachinko is a linkup of multiple routes, and it helps us train for bigger mountains abroad. Words and translations are never simple, though: we use the phrase "play" Pachinko, but don't let that fool you. It can push you to your limits. The Kurobe Traverse is the essence of Pachinko. From the end of 2007 to the beginning of 2008, I spent fourteen days playing it. The linkup entails crossing the Kurobe River and climbing Mt. Tsurugi (2999m), an intricate peak far removed from the world below, with storms that can leave more than a meter of wet snow per night. We descended with difficulty to the valley floor, waded naked through the icy water and climbed onto the steep flanks of the mountain. A blizzard pinned us down for days, and then an avalanche slid us 600 meters. I began to understand our own insignificance. 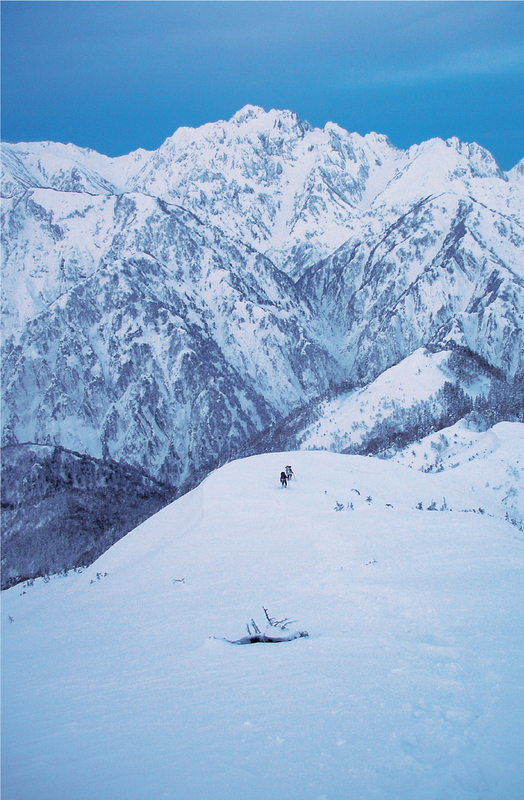 But the more time we spent on the Kurobe Traverse and the more energy we put into it, the more beautiful it became. And as I played this particular Pachinko, I realized that all climbing is illogical. Because we live in a modern, rational world, the value of climbing increases with its irrationality. Pachinko—climbing up, coming back down, then repeating the process—has no rationale. It could be the answer to this age of advanced equipment, technical skills and information: Does our reliance on these means weaken our passion? If so, pick a mountain range. Open a map and trace a route, any route. When you do, you might see that we've only been playing on a portion of a mountain. The more you think about how to enjoy the mountain fully, the more possibilities you'll discover. PASSION, LIKE PACHINKO, can begin with the first freely chosen line. Many climbers clutch guidebooks as they seek their routes—but climbing's not about climbing a topo; it's about climbing a wall. On my first visit to Alaska in 2005, from the Tokositna Glacier, the moment Itchy and I looked at the southwest face of Huntington, we saw a new line present itself. We studied it, and then, though we struggled in the foreign Alaskan terrain, we climbed it. The scale of Alaskan mountains dawned on us. Though we ran up the wall to the summit, the thought of a 2000-meter descent seemed exhausting. As we down climbed the blue ice on the summit ridge, we knew that if our concentration broke, we'd fall to the glacier. We had no information. We couldn't see what was ahead of us. Once, as I rappelled, free hanging, into nothingness, the rope passed through my device and I almost took the plunge. Itchy didn't say much, but I could tell from his gaze that he was holding inside himself the spirit of a warrior. We reached the glacier just before daybreak. There, we lay on our backs for a while, unable to move. At base camp, all we could do was drink sake and stare at the wall. Itchy showed me a book he'd brought to Alaska about Ryoma Sakamoto, a nineteenth-century Japanese samurai and a Shi-Shi, a "man of inner resolution." I imagined myself as Ryoma, expressing my inner being on the mountain. We named our route Shi-Shi after the philosophy he shared: to live with purity you must be able to imagine your own corpse and feel no qualms about it. Climbing can be that simple—you try to draw a line from the bottom to the top; if you fail, you may die. A year later, Itchy and I began a line like that above the Buckskin Glacier on the east face of Alaska's Bears Tooth: if we'd continued, the only options would have been success or death. Though the route seemed doable as long as we followed the ice, we could not overcome one five-meter section. During our retreat we became immersed in something unknown. It was the energy of the mountain, that strange air that made me feel it wouldn't let us escape so easily. Over two days and a mere 400 meters, we felt its relentless power. Deep, unstable snow covered the slabs. The rock would not even accept a piton. We continued blindly and in silence. I wanted to be stronger. I began to feel that the more important the route was to me, the more important it became to climb it with style. I wanted to paint my way of living with the lines I climbed. Three months later, Itchy, Tats and I traveled with Yuki Sato to Bolivia, where we played with multipitch climbs and bouldering to our hearts' content. On the south face of Nevado Illimani (6439m), the highest mountain in the Cordillera Real, we established four new routes. One we named Phajsi Face ("Moon" in the local Aymara language) and another, the Inti Face ("Sun"), because as Tats said, "Our souls were raised like those objects by this adventure." Still, I remained preoccupied with my experience on the Buckskin. For exceptional routes I decided to face them naked, engaging them with my true self. This is the central meaning of the phrase "Shi-Shi." SO WHAT'S THE DEFINITION OF GIRI-GIRI? At first, it was a joke: the Giri-Giri Boys comes from the name of a Japanese celebrity group called the Giri-Giri Girls. Two years ago at the Talkeetna Air Taxi of office, we were waiting for the pilot Paul Roderick to fly us to the Alaska Range, when a receptionist asked us the name of our expedition. We didn't have one. "What's up with that?" I asked Tats. "It doesn't really matter—we can name ourselves anything," he said. But when people started calling us the Giri-Giri Boys, the name stuck. And one night back in Japan over sake, it all made sense. "Giri-Giri" means "barely" in Japanese, and everything about us could be described by those words. We barely have enough money, experience or technique. We're barely young enough to call ourselves boys (perhaps we're too old already). But we want to face the mountain with overflowing motivation and ambition, and we want to climb to our bare limit. Doing so, I believed, would lead us to something that would let our passion take shape. EARLY APRIL 2008: as Itchy, Yusuke and I gazed out the window of the Cessna, approaching the Buckskin, the dark wall formed. Somehow the east face of the Bears Tooth appeared even more intimidating than it had two years earlier. We looked at each other for a moment, then our laughter echoed across the glacier. Half the snow on the lower slab was missing and the exposed rock seemed impossible to climb. 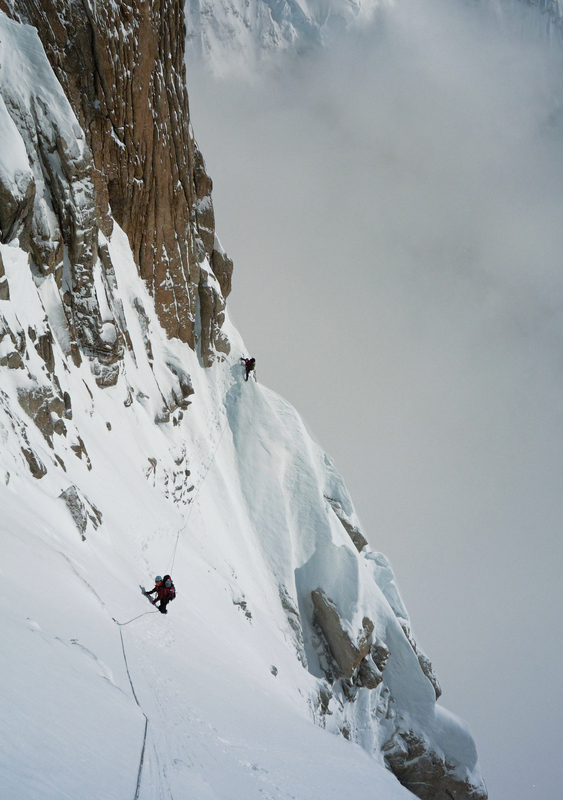 Even if we were able to bypass this slab section, above it lay 600 meters of vertical, thin ice—endless, runout, nerve-wracking climbing on the tips of our picks. "Oh, well," I said. All we could do was gape at the wall with our mouths open: we still weren't ready to climb it. Ten days passed. During a break in the weather we headed for our backup plan: a steep and logical corner just south of The Mooses Tooth and right of The Useless Emotion that zigzagged up the northeast face for thousands of feet to the summit of the Bears Tooth. I'd had my eyes on this line for years. But from the glacier we couldn't see beyond a single line of thin ice on an extremely steep slab. We'd have to decide what to do on the rest of the wall when we got there. At first, the angle daunted us. Yet the line had a sense of presence to it, far more so than the nearby chimney. "What do you think?" I asked Itchy and Yusuke. "I think we can do it." It was uncharacteristic of them to be indecisive, but they didn't consider switching to the chimney either. I told them I wanted to extend our maximum energy toward this enormous mountain and to climb the line it drew from us. If it wasn't to be the east face, it might be this northeast one. Eventually, we all agreed. Itchy led the first uncertain pitch. Before continuing on to the next one, he exclaimed, "I'm psyched!" There would be no more hesitation. Before we knew it, curtains of snow covered the wall, ending our play. The snow continued the following morning... and the next... and the next... and the next. So, we ate, drank and played cards—shortcuts to geriatric diseases. Our time left on the glacier was running out. Finally, the sky cleared. "To the northeast wall again!" The line was steeper than anything we'd experienced; we had to feel the pulse of the mountain in order to climb it swiftly. Yusuke instinctively switched to aid in the corner, so that Itchy and I would not become worried or impatient. But we made sure to mock him: "Was it too hard for you?" I struggled on the pendulum traverse that followed. Every time I bumped against the rock, Itchy and Yusuke hooted. Then Itchy led the beginning of the upper wall, a delicate slab with small edges and thin ice. On the evening of the second day, we reached a cornice. It looked spooky. We were almost at the top. Itchy tackled the steep wall above. "Awesome!" I could hear him shouting. From my vantage point, it looked pretty insane. Soon he must have agreed. "Oh no! I went the wrong way! But it'll work. Come up!" he yelled from a ledge. Yusuke, who was to lead the next pitch, mumbled in protest. But when he began, he slung a knob, then freed the crack above effortlessly. I pulled around the last dangerous cornice to the brilliant smiles of my friends. Behind them lay the huge expanse of Denali. I planned to play Pachinko on it. IT'S EASY TO PLAY PACHINKO IN ALASKA, with its many routes and possible combinations. In May 2008 five of us Giri-Giri boys would play two separate games. It didn't take me long to come up with the idea of linking the Isis Face and the Slovak Direct. I wanted to climb the Isis because I'd met its first ascensionist, Jack Tackle, and I'd seen his clear eyes brighten as he told me its story. It had taken him four years of attempts, but even though he'd been unable to climb to the summit from the end of the route, his excitement never faded. By continuing to the top, perhaps I could take part in his passion. 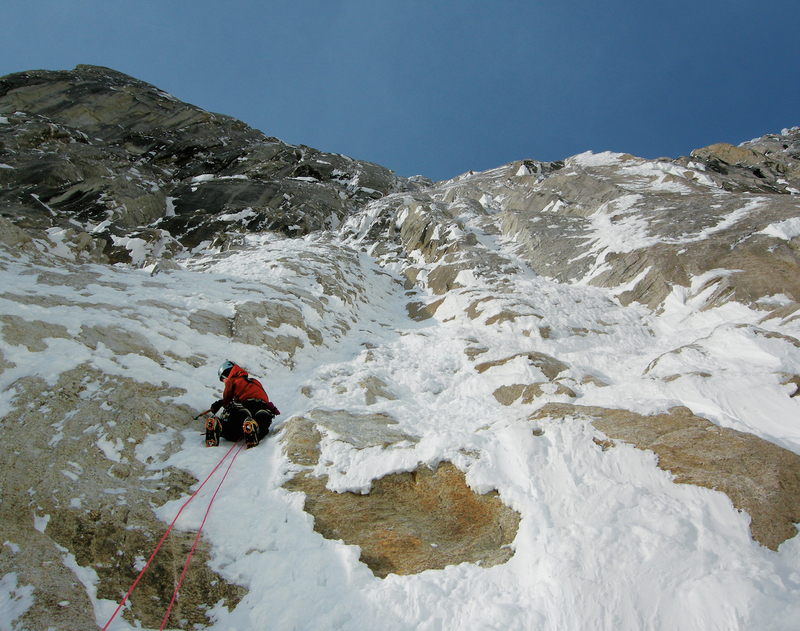 And the Slovak Direct is Denali's most difficult, so of course Itchy and I wished to give it a go. I admit, the whole idea was slightly mad. There weren't too many friends, apart from Yusuke and Itchy, who could take it seriously. When we talked about the plan to local climbers, they'd smile, throw their hands in the air, shake their heads, and say "Crazy!" We took it as a compliment. They described the Isis and the Slovak as "difficult" and "routes with few repeats." It didn't occur to them to link the two together—nor did they give much consideration to climbing the Cassin from the Kahiltna Peaks, Tats and Yuto's plan. I'd first told Tats and Yuto about the ridge that extended from the Kahiltna Peaks to the Cassin while we acclimated on the West Buttress. Tats declared the project "The Real Cassin" because it would make an already classic line even better. They were the kind of climbers who valued the beauty of a line more than the accomplishment. TO PRACTICE PACHINKO, in theory, you need to know how to be light and fast. Our linkup, from May 11-18, would be neither. So what? We desired to immerse ourselves deeply in the mountain. And once we began, we remembered how simple it is just to keep on climbing! We started simulclimbing up the Isis, stretching the pitches, and by the end of Day One we were already about halfway up. On Day Two, however, the weather trapped us in our bivy cave. We were hesitant to stake out so early in the game, but the golden rule of Pachinko is to rest when you can and make solid progress when you move. Indeed, the following day, we finished the Isis in no time. From the top of the South Buttress, we tried to down climb the Ramp Route swiftly, but the slope was steep and covered with blue ice. I'd dropped my sunglasses on the upper part of the Isis, and now my eyes were dazzled, just when one wrong step would have cost me everything. When night fell, we pitched our tent below a stable serac. Inside, we felt comfortable, until, just before dawn, ice chunks began to hit our tent. I buried my face into the sleeping bag, praying they would miss. If the Isis had been easier than we expected, the descent from the top of the South Buttress down the Ramp Route was a perilous maze. Both were filled with my partners' laughter. And each time we had to sharpen our senses, I could feel the mountain with my whole body. A few days later we were on the Slovak Route, in the heart of the south face. By now, without sunglasses, I was snowblind. I offered to do more physical work as the third. A few hours later, I jumared up to a belay, panting with a heavy load. Something in his voice told me they were thinking of retreat. I couldn't find a good reason not to agree. Although my eyes didn't feel too bad, how could I know whether or not there would be complications? Yet my desire to continue was overwhelming. "You won't enjoy it, if you're stuck being the third," they said. Having you guys is what makes it enjoyable, I thought. Every time I jumared up to the belay, they would joke: "Well done, Mr. Mule." If it weren't for partners like them, I would have turned back. Itchy placed only two screws in sixty meters of 100-degree ice. Yusuke rejoiced his way up the 5.9 X pitch. Suddenly, the crux was over and we simulclimbed simpler snow. When we cut a small ledge to pitch a tent, it was already past midnight. The following day, we traversed toward the Cassin Ridge. We were tired by then and ended up camping again at 5600 meters. The thermometer read minus 27 degrees C when we crawled into our tent. That night I thought I heard Tats' and Yuto's voices. We did not know they were missing yet. I peeked outside many times but didn't see anyone. Itchy and Yusuke chalked it up to the altitude. But I now think that Tats and Yuto spent their last night with us. The next day the steepness of the Cassin gradually lessened and we saw familiar scenery. We breathed a sigh of relief and headed to the top. I wished for the game to go on. 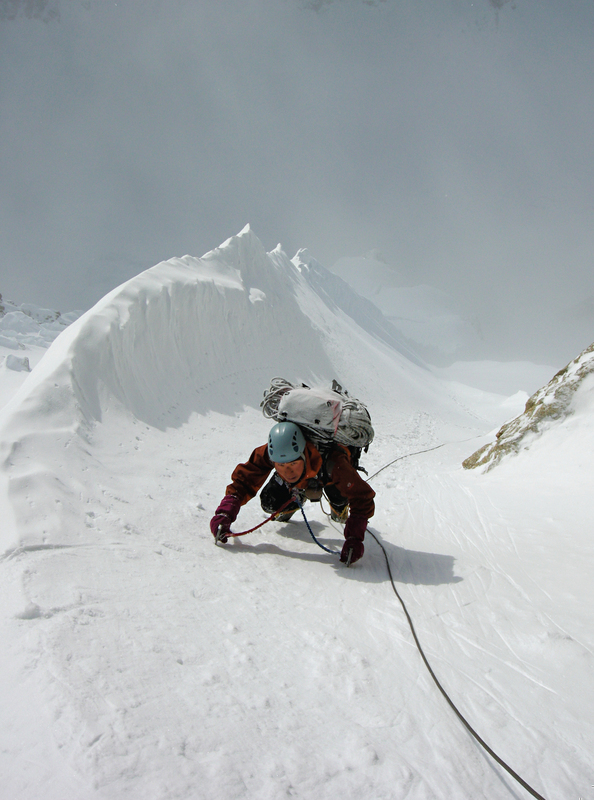 If there had been a wall beyond the summit, I would have said to my friends without hesitation, "Let's continue." ON MAY 18, WHEN WE DESCENDED THE WEST BUTTRESS, we saw Tats and Yuto's tent on the Ski Hill nearly crushed by snow. Footprints led toward the Northeast Fork of the Kahiltna, so we assumed that they gave up the traverse of the Kahiltna Peaks and instead took the regular approach to the Cassin. In my mind, I told them: Come back safely. Back at the Kahiltna airport, we learned our friends had been reported missing. Later, as we flew over the Kahiltna Peaks in the park service helicopter, I could see their tracks along the dramatic, five-mile Kahiltna ridgeline that ascends to 13,440 feet. We saw a campsite at 17,000 feet on the Cassin and followed their trail to around 19,000. Tats and Yuto had told us they planned to take five or six days' worth of food and fuel. According to their journals, they may have started as early as May 10. By the time we returned to the Kahiltna, if they were still alive, they may have been without food or water for days. And then on May 23 the weather that had held since we were partway up the Isis Face broke down. I do not want to praise someone just because he is dead. Tats and Yuto were younger than we are, but they were rare, dedicated alpine climbers. They were easygoing, and we all loved drinking together. They did not have as much experience or developed techniques, but they had a fierce passion for climbing, one that is impossible for us fully to understand. We must not forget to praise them for what they did. For as I look again now at the ranger's photo I see the line Tats and Yuto attempted. It makes no sense, but I am simply happy. I can see the passion they notched in the mountain. In this world of boundless information, all you know for sure is what you see with your own eyes. But even when you stand before a wall, you may have doubts. The act of climbing remains the only path a climber can trust. It is only when you act that you can truly see. So for the climbers and their dreams in Alaska, for our dear friends who left their enormous passion on the mountain, and for us who are to return to Denali, we named the line on the Bears Tooth, "Climbing Is Believing." PACHINKO STARTS WITH A DESIRE TO KEEP CLIMBING. And by continuously climbing, it naturally takes on a physical form. With fair weather, good luck and imagination, any modern climber should be able to discover his or her own Pachinko. Yet there may still be problems a climber cannot solve—and you may die in the game. Years ago, I took a picture of Itchy on the Buckskin Glacier heading straight toward that awesome wall formed by the east faces of The Mooses Tooth and the Bears Tooth. I want to keep my inner bearing always as such: head down, moving toward an objective without hesitation. It is both beautiful and immeasurable. I can head straight toward the mountain without losing my way. I learned this passion from Alaska, and from Tats and Yuto. Someday on the mountain, I hope to realize my own Giri-Giri Style.